Sankt-Petersburg 1832. 80 pp., 17 tables of illustrations. A4 size. In Russian. 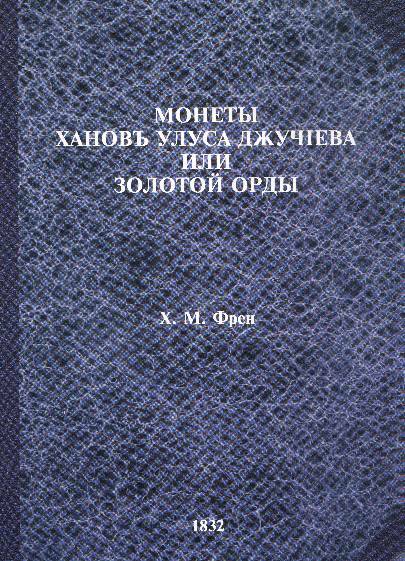 Reprinted edition of 2001, Nizhniy Novgorod. Orders are accepted by Vladimir Belyaev, charm@postman.ru. Number of copies available for ordering is limited. An extremely important early work on the Golden Horde. It also includes some coins of the Giray Khans, Abbasid fulus, Tahirids, Samanids, Khwarezmshahs, Chingizid, Chaghatayid, Timurid, Shaybanid, Manghits of Bukhara, Umayyad, Ilkhan, Jalayrid, Afsharid, Zand, Qajar, and others. The Golden Horde portion is by far the most important, and it includes some of the rarest rulers. Legends are written out, and there are line drawings in plates at the back. There are also references to Recensio numbers [Fraehn, Ch. M. Recensio Numorum Muhammedanorum. Academiae Imp. Scient. Petropolitanae, St. Petersburg, Russia, 1826. In Latin]. It is obviously incomplete, but definitely very useful.